The readers of Cydonia Quest will be viewing this website with computer screens of various sizes and shapes, which will be using different screen resolution settings. It is therefore highly unlikely that most readers will be seeing the Cydonia Quest web pages at the level of "zoom" intended. For most people the pages may seem too narrow and with text that seems a bit small. Fortunately, it is very easy to increase or decrease the size of web pages on your screen using facilities built into your internet browser. Readers with touch screen tablet computers will be used to using finger gestures to zoom in and out of web pages. 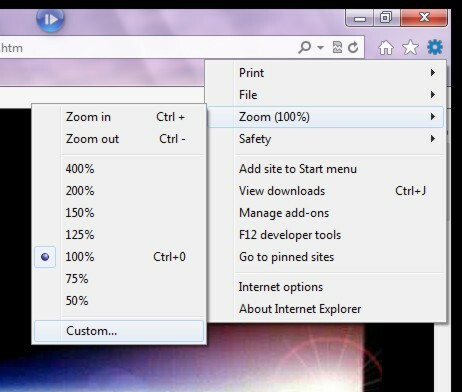 Not all users of desktop and laptop computers know that they too can alter their zoom within an internet browser. This tutorial is therefore intended for them. Web pages that appear on the small side can be "zoomed up" to fill the screen - and web pages that are too big to fit the width of your computer screen can be scaled down to fit it. In the case of Cydonia Quest much of the evidence presented is pictorial, so the ability to examine the images at higher or lower levels of magnification can greatly enhance the viewing experience. It is highly recommended that readers experiment with viewing images on Cydonia Quest at different levels of zoom. The following explains how to change the "zoom" using either the computer keyboard or the mouse cursor. Using your Keyboard to control the Zoom level in the Microsoft Internet Explorer, Mozilla Firefox and Google Chrome browsers. This method probably works for other browsers too - and is perhaps the easiest way to control the zoom level. To increase the zoom - Keep the control key ("Ctrl") pressed down and at the same time hit the plus ("+") key twice. This will increase the magnification of the web page by one standard increment. Each time this procedure is repeated the web page will get larger and larger. To reduce the zoom - Keep the control key ("Ctrl") pressed down and at the same time hit the minus ("-") key twice. This will reduce the magnification of the web page by one standard increment. Each time this procedure is repeated the web page will get smaller and smaller. Cydonia Quest web pages allow the reader to make the text size larger or smaller independently of the zoom level - as do many other websites. This can be useful for some readers. I find it useful when an extra wide web page has to be zoomed down to fit the width of my computer screen, but the text size is then too small to read. The current Google Chrome browser does not have a facility for changing text size, but Internet Explorer and Firefox do. Method - Hold down the "Alt" key and the letter "V" key at the same time. This will bring up the "View" menu on the screen. From here rather than using the keyboard it is much quicker to use the mouse cursor to navigate the "View" menu once it appears after pressing "Alt" and "V" together. In Internet Explorer - In the side menu that opens up, click on the desired larger or smaller text size. The text size on the screen will now change - but only if the particular website allows this. 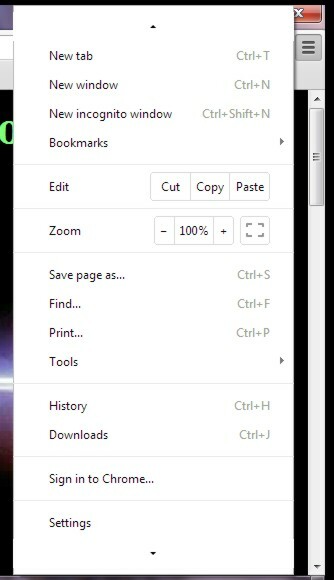 In Firefox - In the side menu that opens up, click on the "Zoom Text Only" option. Then click on the +/- zoom controls higher up the menu to change the text size. To return to the more general zoom option make sure that the "Zoom Text Only" option is un-ticked again. Sometimes in Cydonia Quest web pages it is suggested that readers might find it useful to view especially large images in "full screen" mode. This is very easy to do with the computer keyboard. To access "full screen" mode - press the "F11" key at the top of your keyboard. To leave "full screen" mode - press the "F11" key again. Using the Mouse Cursor to control the Zoom level in the Microsoft Internet Explorer, Mozilla Firefox and Google Chrome browsers. (1) Click on the cog icon symbol in the top right of the browser screen with the mouse cursor. This will reveal a new menu box. (See Figure 1 below). This cog icon symbol could change in future versions of the browser, but the relevant icon will probably remain in that location. 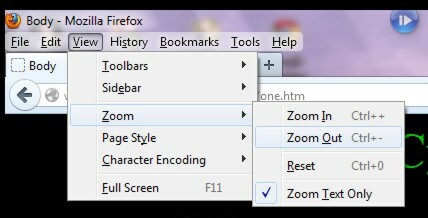 (2) Hover your mouse cursor over the "Zoom" option to bring up the zoom options menu. (3) Click on the desired level of zoom. Clicking on the "Custom" option on the zoom options menu will reveal a box in which any exact level of zoom can be entered. To do this it is necessary to add the "Menu Bar" to your browser view first. This can be done temporarily by pressing "Alt" and "V" on your keyboard. In it's more recent versions of Internet Explorer Microsoft have made it diabolically difficult to find the "Menu Bar" and display it more permanently using the mouse cursor. (2) Click the RIGHT mouse button, which will bring up a "bar" menu. (3) Left click the "Menu Bar" option and it will load the "Menu Bar", which has all sorts of very useful options. (This assumes the "Menu Bar" option hasn't already been ticked for Display). See Figure 2 for example of loading the "Menu Bar". (3) In the side menu that opens up, click on the desired larger or smaller text size. The text size on the screen will now change - but only if the particular website allows this. See Figure 3 for example. This is a way of seeing more of a web page at the same time whilst browsing the internet. This is useful when viewing a diagram or image with a length much greater than the depth of the normal browser display pane. (2) To enter full screen mode click "Full Screen" at the bottom of the "View" menu. (See Figure 3). (3) To leave full screen mode push your mouse cursor against the very top of your computer screen. A bar will now appear there. Clicking on the second button (with a symbol of two overlapping squares) on the right of this bar will restore the normal viewing mode. To do anything in Firefox you really need the Menu Bar to be displaying. 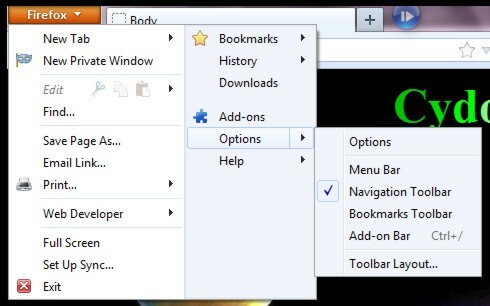 In earlier versions of Firefox the Menu Bar displayed automatically after the browser had been downloaded. Now the Firefox user has to do this for themselves. (1) Click the orange coloured "Firefox" button in the top left corner of the browser screen. (3) In the side menu that now opens up click the "Menu Bar" option. See Figure 4 for example. (3) Click on "Zoom Out" or "Zoom In" as desired. See Figure 5 for example. (3) In the side menu that opens up, click on the "Zoom Text Only" option. Then click on the +/- zoom controls higher up the menu to change the text size. To return to the more general zoom option make sure that the "Zoom Text Only" option is un-ticked again. See Figure 5 above for example. (2) To enter full screen mode click "Full Screen" at the bottom of the "View" menu. (See Figure 5 above). 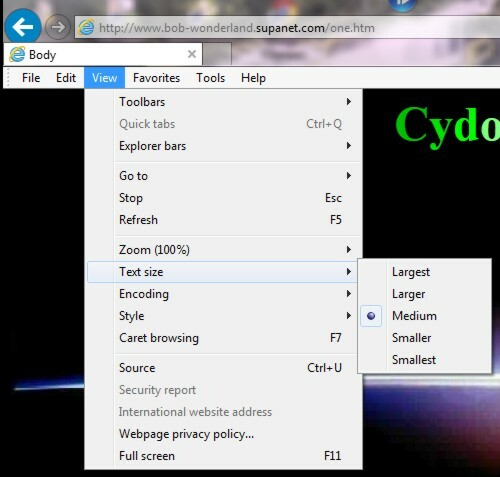 (1) Click the icon in the top right of the browser screen. In the current version of Chrome this is a button with three horizontal lines across it. (In older versions it is a cog icon). (2) Half way down the menu box that opens up is a zoom control where clicking on either the "+" or "-" symbol makes the current web page bigger or smaller. See Figure 6 for example of this. Chrome doesn't seem to allow the user to do this, unlike the other browsers. 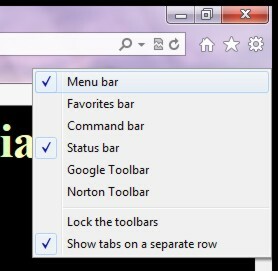 (1) Open up the menu box the same way described for the Chrome zoom control section above. (2) At the far right of the zoom control bar is an icon showing the corners of a rectangle. Clicking this icon will cause the browser to enter Full Screen mode. (See Figure 6). (3) To leave full screen mode push your mouse cursor against the very top of your computer screen. A message will appear - "Exit Full Screen". Click on this to restore the normal view.